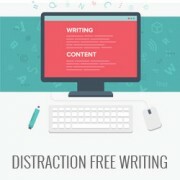 Do you want to write faster and eliminate all distractions? WordPress comes with a distraction free writing mode. However many users feel that distraction free writing mode in WordPress lacks some important features. In this article, we will show you how to improve the WordPress distraction free writing mode. 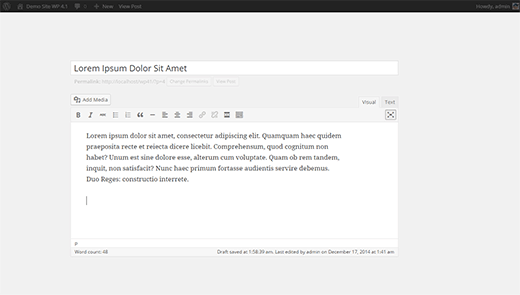 WordPress comes with a powerful post editor screen with many features. There is a whole column of options on the right and below the post editor. 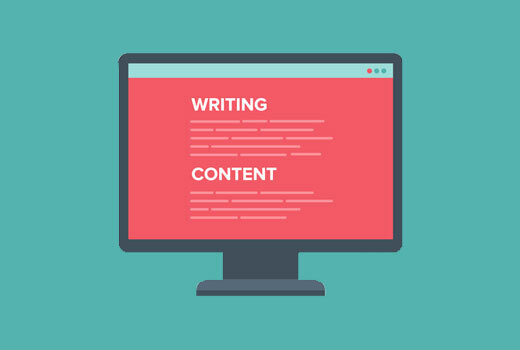 Many users find it perfectly adequate for writing their blog posts. However, some users need a more clutter free space to turn their thoughts into words. For those users, WordPress comes with a distraction free mode (DFM). Clicking on the distraction free button hides other options from the screen. 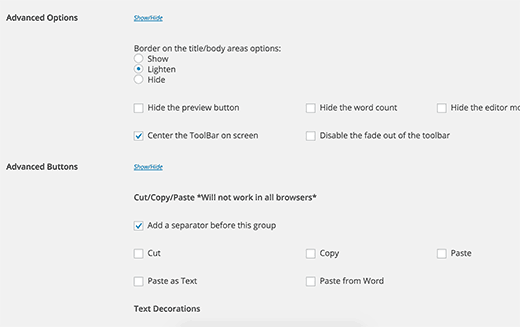 This new distraction free mode was introduced in WordPress 4.1. It replaced the older DFM which actually hid all the screen elements and provided a real full screen writing space. However, users felt that it lacked the necessary buttons and controls that they needed. Just Writing is a WordPress plugin that provides a simpler solution. It combines the old distraction free writing mode with the flexibility to choose the buttons and controls you want to display on screen. First thing you need to do is install and activate the Just Writing plugin. Upon activation, you need to visit Users » Your Profile and scroll down to Just Writing section to configure the plugin settings. First you need to make sure that you check the box next to Enable. After that you can choose your Just Writing controls under the quick options. Minimal – has nothing but save and exit. 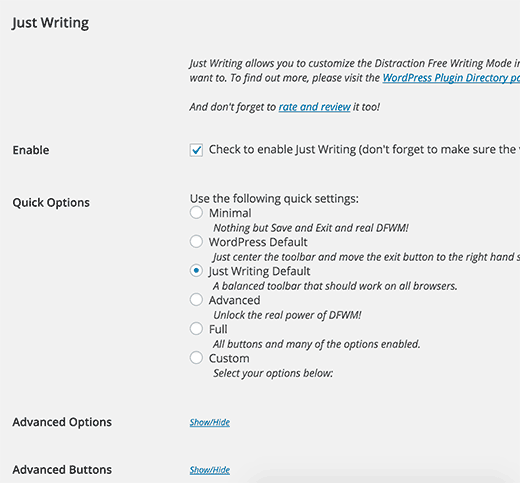 Old WordPress default – Looks like the default distraction free writing mode used before WordPress 4.1. Just Writing default – a balanced toolbar with a handful number of controls. Full – All buttons and many of the options enabled. Choosing custom will show advanced options below it. You can choose options and buttons you want to display on your custom distraction free mode. Don’t forget to click on the update profile button to save your settings. 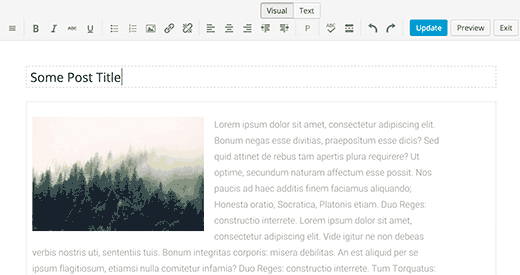 Since WordPress 4.1 revamped the distraction free editor, Just Writing added its own writing page. You can add a new post in the Just Writing’s DFM by visiting Posts » Write. 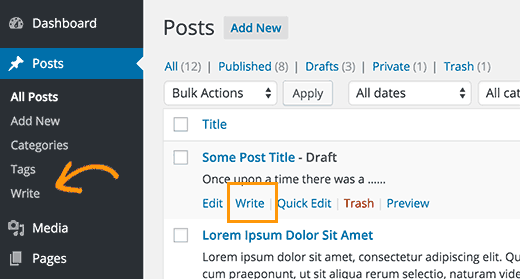 You can also edit drafts and other posts by clicking on the ‘Write’ link below the post. Just Writing’s distraction free writing mode will launch with the options and controls you selected in your profile. WordPress isn’t great at creating a distraction-free environment. You’ve got to make your own! Thanks for the recommendation, I was just thinking about how WordPress’s distraction-free mode still leaves a lot to distract. The way the sidebar hides and shows feels awkward, and when I want to preview, the button is lost off the bottom of the page. This plugin looks great. I just edited a post with it, and the default option does a nice job of docking everything I need to the top of the screen, and completely hiding everything else. If WordPress were going to do their own, I don’t know why they couldn’t have done it like this!